The Firm's valuation services stems from the accounting, audit and tax areas of the practice along with our Firm's commitment to continuing education in this increasingly important discipline. We advise prospective business purchasers about local market conditions, industry trends, and the financial condition of an acquisition candidate. If you are selling a business, we can offer advice for obtaining the best possible sales price and contract payout terms. We can assist you with the selecting and implementing the approprite plan for your company. 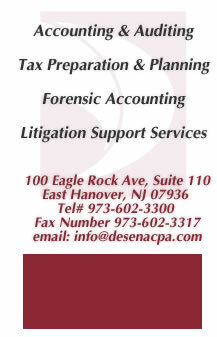 We also can provide the audit services required by the Department of Labor and ERISA for larger plans. Our firm can also help your firm weigh the complex benefits and costs posed by todays qualified and nonqualified pension and profit sharing plans, including 401(k), SEP, SEP IRA, Keogh, as well as, life insurance and health insurance plans.